It entered at number 26 last June and finished at number 28 this week. 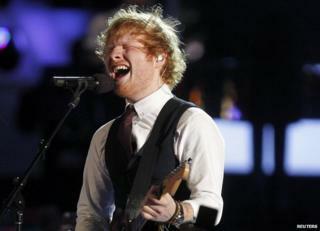 Sheeran can thank the ballad's enduring popularity on streaming services, where it was the 19th most-played track of last week. Thinking Out Loud has now achieved a combined sales and streams total of 1.65 million. The track also holds the title for the longest climb ever to the top spot as it took 19 weeks to get to number one after its release. Other songs that have come close to Sheeran's record in recent years include John Legend's All Of Me that managed spent 44 consecutive weeks and Pharrell Williams' Happy that lasted 49 consecutive weeks in the Top 40. Other songs have had longer non-consecutive runs, notably Frank Sinatra's My Way, which spent 75 weeks in the Top 40 between April 1969 and September 1971. Thinking Out Loud is taken from his album X, that has also now logged a full year in the UK album chart top 10. The album has spent 12 non-consecutive weeks at number one and is at number five this week. X has sold 2.23 million to date and is currently the fifth best-selling album of the decade.